MEN BUST DURING OPERATION VAT ALLES! NORTHERN Cape cops cleaned the streets of three towns during operation Vat Alles on Saturday. They arrested three men and confiscated goods worth about R3,5 million. The operation focused on recovering stolen or hijacked vehicles, illegal possession of firearms and ammunition and theft of stock and wildlife. Various specialised units under the command of John Taolo Gaetsewe commander Major-General Johan Bean executed searches, seizures and arrests. Police spokesman Captain Sergio Kock said: “In Delportshoop, a suspect was arrested for possession of four unlicensed firearms and ammunition, seven alleged stolen vehicles and one trailer. Eight tortoises were confiscated and handed over to nature conservation. “In Kathu, a 42-year-old man was arrested for possession of one unlicensed firearm and 62 rounds of ammunition were confiscated. 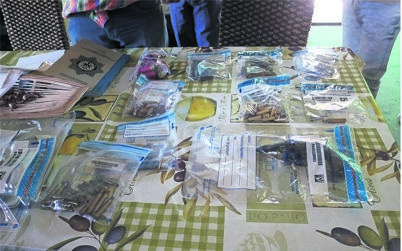 “Two empty magazines, laptops, computers, cameras, modems, cellphones, €2 400 (R38 955) and two vervet monkeys were also confiscated. The police also recovered five allegedly stolen vehicles.